I found this interesting concept vehicle this morning, but I don’t think it is properly named. It is called the Crows Nest Anti-Pirate UAV. Now, you are probably thinking that this is some new Unmanned Aerial Vehicle that is designed to take out pirates. Sounds cool, doesn’t it? Like some sort of brand-new series like Pirate Busters. It could be fictional action show or reality show. However, you should know that this UAV is just 12 inches tall and 24 inches long. Yeah, that’s sort of like sending a model airplane to hit someone in the face. I suppose that could knock the wind out of a pirate. Best case scenerio, it could knock them off of the ship. Har! 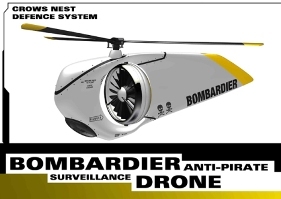 I do be thinkin’ that the Crows Nest Anti-Pirate UAV is the bane of my existence. Those things are tough to swat! You hear what I am saying. These things are not designed to take on pirate single-handed. I think the purpose of this UAV is either a toy or something to prevent piracy overall. After all, it comes with an HD video camera on board, as well as a GPS so the UAV knows where its going. Well, I can’t wait to see if this ever gets to be mass-produced. I suppose we’ll either have the latest flying toy or a new way of patrolling the seas.